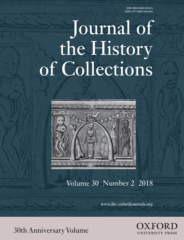 The Journal of the History of Collections is dedicated to providing the clearest insight into all aspects of collecting activity. The range of the journal embraces the contents of collections, the processes which initiated their formation, and the circumstances of the collectors themselves. Francesco’s studiolo was a jewel box-like space decorated with over 40 works of art and featuring built-in cabinets displaying the Grand Duke’s collection of art and natural specimens. A sumptuously decorated cabinet of curiosities, Francesco’s studiolo is open to the public but often overlooked by tourists. Visitors who discover the space may admire the decorations but be disappointed to learn that the objects originally stored in the cabinets have long since been dispersed. Until recently, scholars could only make educated guesses as to the types of specimens displayed. That is, until the summer of 2014, when I discovered the only known inventory of the room, buried within millions of archival documents at the Archivio di Stato di Firenze. This find changed what we know about the types of objects displayed in the room, allowing scholars and visitors to more completely imagine how the space looked in the 16th century. Using a common Renaissance trope, the studiolo celebrated Nature’s inventive capacities. Francesco would have entered the darkened space to examine his objects in solitude, as – with only a few exceptions – he prevented anyone but himself from entering the room. This privacy has limited scholars’ knowledge of what kinds of objects were displayed. The inventory, taken in 1574 after the death of Francesco’s father, Cosimo I, provides valuable information about both the individual objects on view and how the objects were grouped together by cabinet. Image Credit: Studiolo of Francesco I, Palazzo Vecchio, Florence. Photo by the author, used with permission. Generally, objects are organized by material. The first two cabinets were dedicated to specimens of stone, such as “one roundel [or sphere] of oriental alabaster in a white chest.” Rare and unusual stones had long been a focus of Medici collecting; Lorenzo il Magnifico amassed a legendary collection of hardstone vases, and Francesco’s brother and successor Ferdinando I would later commission the Cappella dei Principi, an ostentatious funerary chapel decorated with inlaid stone. The third cabinet contained objects and works of art in metal, including “two crosses, one of bronze with Christ in relief.” Within the studiolo’s program, man’s ability to shape and mould elemental metals represented a key illustration of man and nature working together to produce ingenious creations. Cabinet number six featured arms, examples of man’s ability to fashion natural elements into deadly weapons. Specific objects included “one German rapier with a courtly point and its sheath and hilt.” Stiletti, maces, swords, and a club rounded out the menacing arsenal. Cabinet number eight contained a variety of objects, ranging from musical instruments to printed matter, including “four imprints in iron for impressing medals… and their reverses, in four red leather sacks.” While it is difficult to assign an over-arching type to these objects, which also included seals and horns, they tended to be objects serving an official or ceremonial purpose. While the inventory does not give specifics regarding the subject matter of these pages, it makes it clear that the ideas embodied in the collected objects on display in Francesco’s studiolo were as important as the objects themselves. The possibility that the myths and technologies illustrated in the studiolo’s decorations could correspond with written accounts, rather than physical objects, related to their subject matter has not previously been explored − perhaps we needed to find this inventory to even consider it. 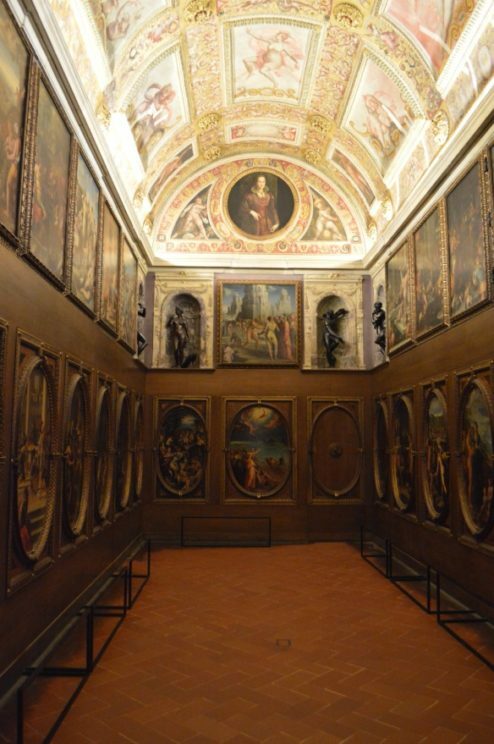 The surprising realization that four of the eleven cabinets in Francesco’s studiolo contained writing and art on paper demonstrates the value of archival research, especially for scholars who desire a more complete understanding of the kind of objects collected and displayed by the most elite patrons of the Italian Renaissance. Featured Image credit: “Florence, Italy” by OpenPics. CC0 via Pixabay. Lindsay Alberts is Professor of Art History at the Savannah College of Art and Design, where she teaches survey and early modern courses. She received her PhD from Boston University, where her dissertation explored the intersection of early modern collecting and Medici political authority in the foundation of the Galleria degli Uffizi. She is currently working on a book project on the Cappella dei Principi at San Lorenzo in Florence, investigating the site's political ambitions expressed through the material collection of both granducal bodies and stone specimens. Her recent publications have appeared in the Journal of the History of Collections, Comitatus, and on the Art History Teaching Resources blog. Her paper on 'Francesco I’s museum: cultural politics at the Galleria degli Uffizi' was published in the Journal of the History of Collections, and featured in a collection on Art and Art Spaces from Oxford Journals.